This exquisite padded topped 38 Lincoln Custom was restyled when the car was very new, perhaps even straight from the dealer. It has this wonderful early Custom Car look, a look fortunately getting back in style these days. Some time ago I was in the progress of gathering material on an article about the removal of the running boards on early Custom Cars. I was researching the subject with some of the the photos I have in my files. I was planning to include a photo of this very nice 1938 Lincoln convertible, but since this car is such an amazing beautiful restyled car I decided to not include it in that article, but do a full CCC-Feature on the car. Not that I do know a whole lot about the car, but just because it is absolutely stunning and hopefully an full article might be noticed by more people, and hopefully one day we will be able to know more about this car. Let me share what I do know about this exquisite 1938 Lincoln. 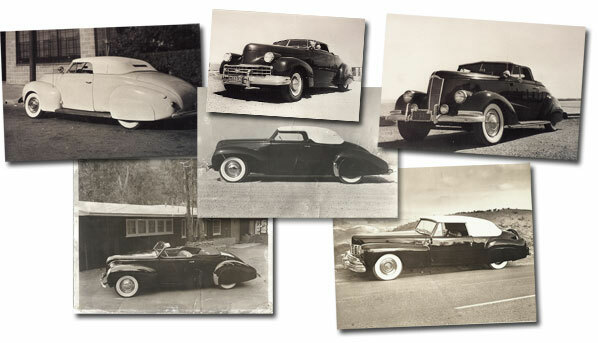 Several years ago, Ron Brooks from Castro Valley, North California, send me a couple of photos of some very early Custom Cars. Ron had received some of them them in the 1990’s from an retired fireman who knew Ron was into Customs, and particular into Custom Cars with an C.A. Hall Top Shop padded top. 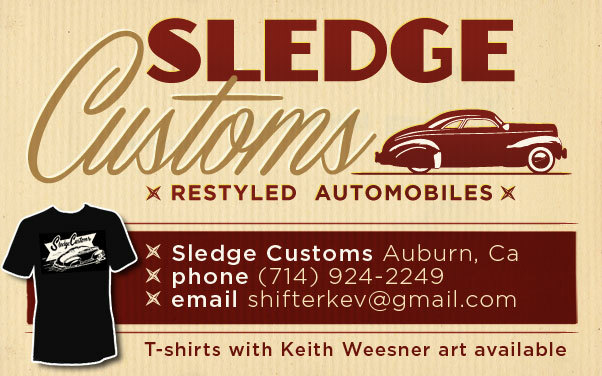 You see, Ron owns an old Custom, a 1940 Chevy convertible with an original Hall top. The retired fireman came across these photos when he was in the old Hall shop, where he found this stack of old photos, which happend to be all Hall topped Custom Cars from the very early 1940’s. Ron has tried, but never was able to find out anything else about this Lincoln. Some of the photos Ron Brooks shared with me several years ago. Very nice early to late 1940’s Custom Cars in a clean early style I very much admire. The first photo I saw was this amazing side view. What appears to be a photo taken by a professional photographer. 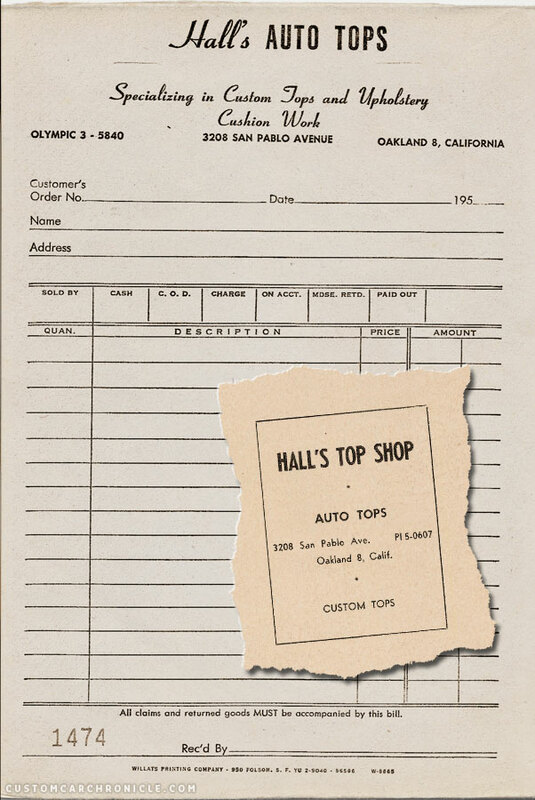 Perhaps hired by the car owner, or possibly by the Hall Top shop to be able to use for promotional matters. The side view is stunning, with the chopped windshield, the removal of the running boards, the perfect stance and the wonderfully shaped rock shield on the rear fenders. When I mentioned to Ron that I liked the ’38 Lincoln so much, he send me another one he had. This one taken from an higher point of view and with the top removed. Ron mentioned that the eucalyptus trees in the background have a distinctive Oakland/East Bay hills look! As mentioned in the into there is not really all that much we do know about this beautiful car. We have no name of the owner, no builders name other than that the car most likely had a padded top created by the Hall Top Shop in Oakland California. We also do not know what ever happened to it. At first all we had where two amazing photos shared by Ron. 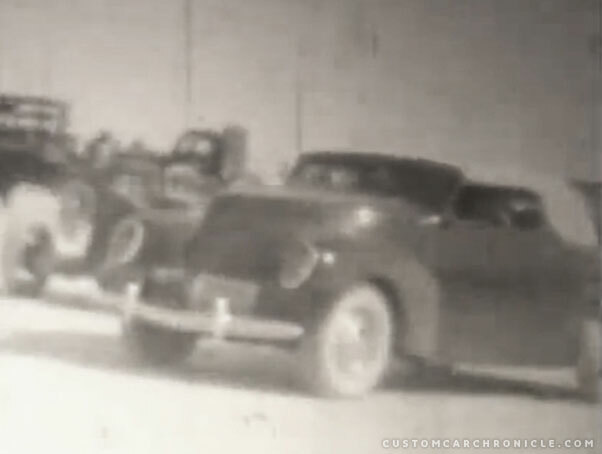 But then in 2012, Dave Welles of Seabright Hot Rods shared some amazing 1940’s footage taken at Harper Dry Lake taken by his uncle Tommy Lorbeer with his brand new 8mm camera. 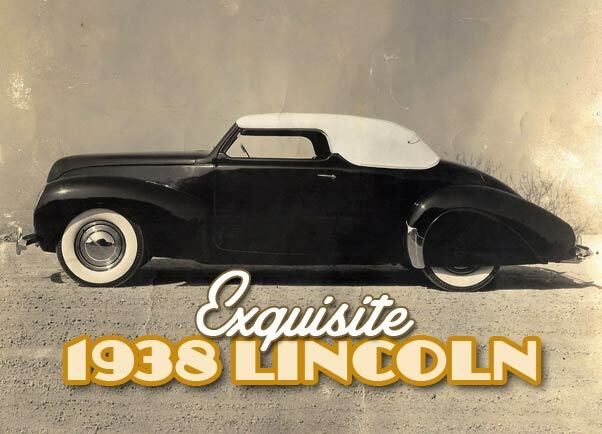 The short movie itself is already amazing, but when I watched it I got goose bumps when I saw this wonderful 1938 Lincoln with padded top cruise by over the dry lake. I recognized the car immediately… That is the same one as Ron send me, the one with the Hall top on it. I took a few screen shots to compare the two, and it sure was the same car. 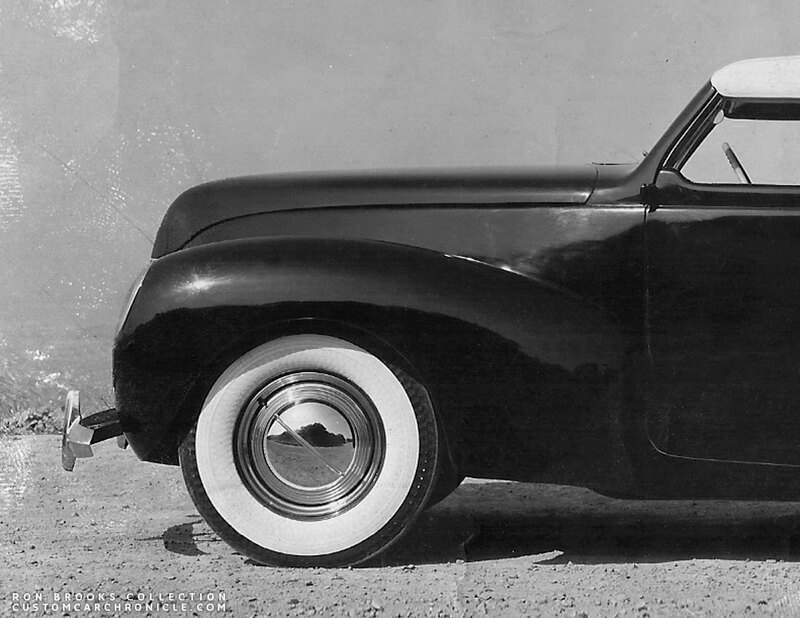 So now we knew that the Lincoln was a very early Custom, and that it was built between 1938 and 1940. The car appears only for a second or two in the movie footage… but it is amazing to see it driving. And even better is that we can see it a little from the front as well. Although very blurry we can see that it has a modified grille. Movie still from the Tommy Lorbeer movie shows a modified grille in the Lincoln. Its hard to tell from this material if the grille was home made (quite common in those days) or if an exciting grille was used. The car has been restyled with on main goal in mind, improving its looks over the factory stock look. Not just to modify it to stand out from the rest of the cars. We have seen similar restyling done by shops as Jimmy Summers, Bistange brothers, Olive Hill carage, but also by shops specialized in coach building more exclusive cars. So my guess is that this Lincoln was brought to one of the Nor Cal coach building shops for an exclusive restyling. I added these cropped sections of the photo to be able to take a closer look at the details. Possibly the car was dressed up with a set of Vogue wide white wall tires. The rear fender rock shield is very nicely shaped, and the shape of the padded top is perhaps a bit more upright than we are used to from the later part of the 1940’s, but it fits this Lincoln absolutely perfect. This photo shows the horizontal grille bars in the custom grille. The modifications we can see in the photos are all extremely well done, and in style with the rest of the cars line. Chopped windshield, very nicely shaped padded top, removal of the running boards, with an molded in panel to cover the exposed frame after the running boards where removed. Removed side tim, removed hood side trim. nicely shaped stainless or chrome plated rock shield on the rear fender, front fender reshaped at the back. Modified grille, one of Ron’s photos shows that the grille has horizontal bars, perhaps a 1940 Willys grille was used, but it could also be possible that a new smaller grille was hand shaped and chrome plated.The car was lowered all around and set on nice shaped wide white wall tires with single bar flipper hubcaps and beauty rings. 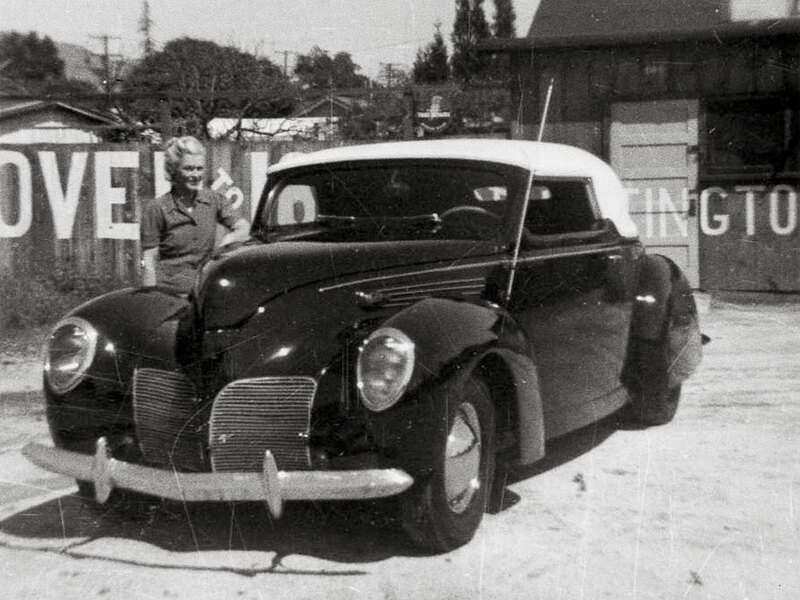 The bumper at the front looks to be stock, but the shadow on the side view photo indicates that the rear bumper might have been replaced with an 1940 Lincoln unit which has the opened-up center section. 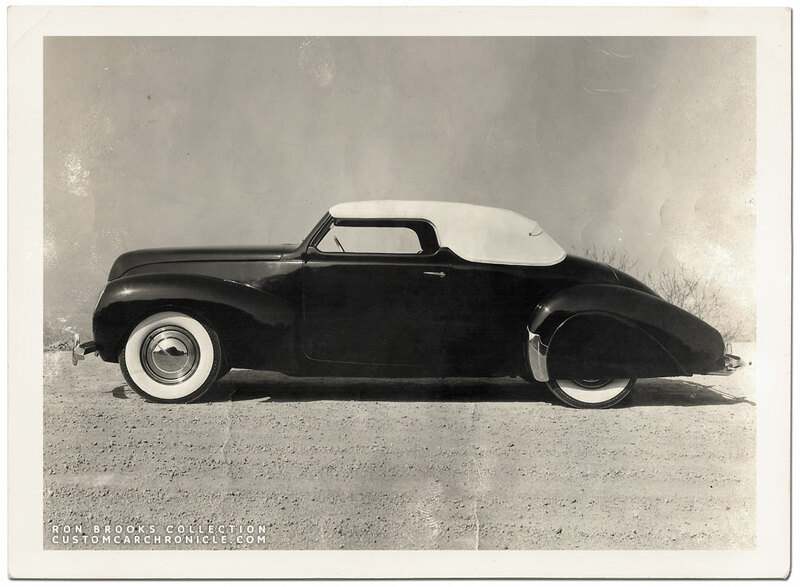 I have been able to find one other photo of a 1938 Lincoln that has similar modifications done to it. I do not think its the same car, but the resemblance of the two is striking. I found the photo online a few years ago, and compared it with the photos Ron shared right then. But this car has the stock grille, and an different shaped padded top and the stock trim still in place, and not stainless rock shield on the rear fenders (perhaps a rubber one, hard to tell). 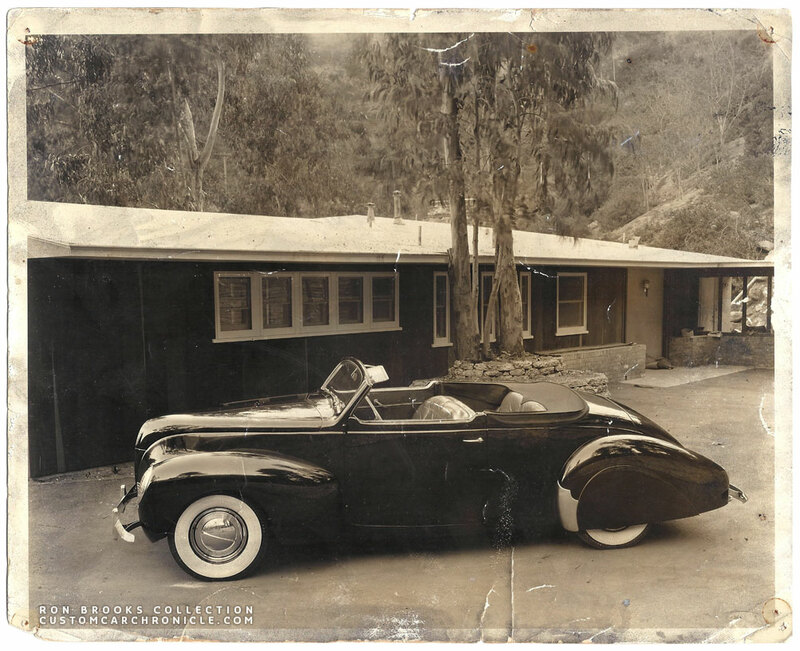 Perhaps the car in this photo could be an early version of the Lincoln taken in 1938-39. But more than likely there where two, and perhaps more of these that had similar styling. 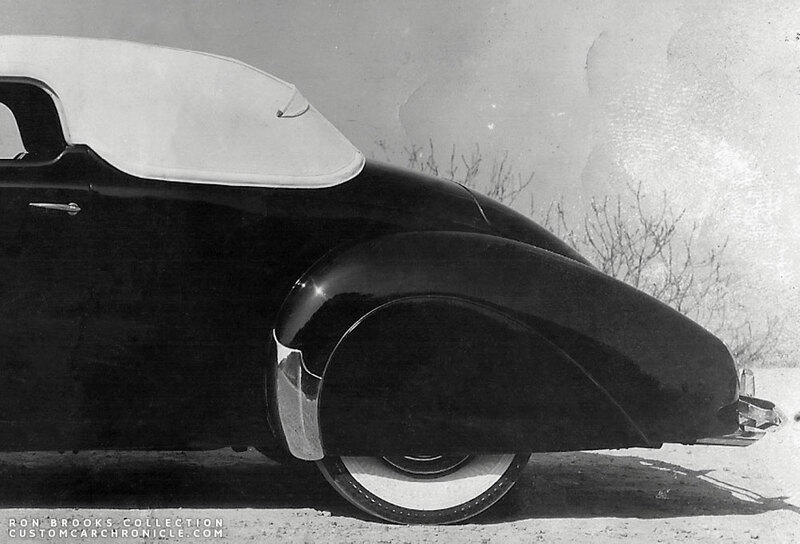 Most likely a different 1938 Lincoln Custom with pretty similar changes than the Lincoln in the Ron Brooks photos. The black wall’s indicate that the photo was taken during or shortly after WWII. Hopefully this CCC-Article will lead to some more information about the origins of this well designed masterpiece. A beautifull car like this must have been noticed back then, and some people must know more about it. Even the camera man of that 1940 dry lake movie noticed its beauty. If you know more, please email Rik, so that we can add the info to this article. Many thanks go out to Ron Brooks for saving and sharing these amazing images. Thanks Rik, wonderful article that brings together all the elements of a mystery car , hopefully we will someday have more info on this one! Once again, Thankyou Rik and Thankyou Ron for bringing this to light. I just love the look that this car has. It is indeed one of my ultimate favorites. Every element has been achieved with style. There is a Lincoln padded top roadster being built in Norway, I think?? That may hopefully resemble this car once done. It has been a favorite for me too since I first saw it in the Lincoln customs thread, absolutely gorgeous. Thanks for sharing.